Moving, Moving, Moving…keep those books a moving! Moving Moving Moving, Rawhide? No, we’re not looking to truly rewrite the lyrics to that most popular tune, but we are certainly moving! Today began the library’s official move back into the original digs. There was much rejoicing…until we saw just how much we had to move. I recall moving into Avila Hall only a few months ago, but it would appear our humble collection of stuff has grown…considerably. For my own part, the trip that took three bags when we moved in to AH took me six today! Offices are beginning to take on the “owner’s” personality as we slowly move our packages, boxes, and bags in and unpack. Tomorrow the real fun begins. The books are a’moving. Hallett, the folks who moved our books out in April will be returning in force to put the books back…sort of. As many of you know, we’ve moved to a closed stacks system, so many of the books will be moved into an alternative space next door. We will, however, be keeping the reference books for both Avila and St. Paul’s, the curriculum & children’s lit., play scripts, some folios, and the easl books in the library. In addition to those, we’ll be creating a section for faculty recommendations. These books are meant to be those a faculty member would like students to have quick access too, but not necessarily as important as those that will be placed on reserve. As we go through this extensive moving process the library will, unfortunately for some of you, remain closed. A grand total of 10 days has been set aside to allow us to get moved in, set up, and settled before the semester gets going. Our soft opening has been (tentatively) planned for August 21st with a “grand opening” ceremony on the 25th. If you are on campus during our closure and are in need of a computer, please go to Hodes. They are, once again, taking care of our displaced students. They will be open from 8 – 5 on the weekdays. I realize this blog is a little wee, and doesn’t really give too many details as to what is coming. Maybe we want it to be a big surprise, Eh? So, stay tuned to see what sort of fabulous new goodies we’re bringing you in the new space and to get some information about the move! As the fall semester approaches (too quickly, for some) the library & learning commons staff are beginning to plan. It’s never quite safe when the librarians plan…but it’s happening all the same. This year, in a small change of pace, we’re looking for ways to reach out to our campus and community. We want to be more directly involved in your education and entertainment. So…this post is all about some of the ideas being tossed around as we plot. Bring gaming to the library! All kinds of games. Chess and Checkers to Risk and Settlers of Catan. Also, host maker nights for games…create your own game and play it sorts of events. Speed Book Dating or Blind Date w/ a Book evenings. We’ll break out the comfy chairs and maybe a bean bag or two while you and your peers meet some new books. Books will be from the library and from the participants, covered, and have a dating profile styled description. Pick your “match” and sit and read for a bit. Movie night. Pretty self explanatory, eh? Video making contests w/viewing parties. The first of these would be for Halloween. We’ll want you and anyone else you’d like to include to make a halloween video (appropriate of course), submit it to us in some format tba and we’ll have a viewing party to pick a winner. Prizes are also tba. Read In events. As many activists do “sit-in’s”, we may host a read-in event to support reading or banned books week or some such literary holiday. Technology and Researching workshops. We’re adding new technology as fast as we can and trying to keep new and shiny things available to the Avila campus. We are considering hosting workshops in the library on how to use/do certain things. Specifically the video making equipment and software we’re adding to the “yet to be named” presentation room. Scavenger hunts. If we do this, we’re hoping more to participate in a campus wide event. You’d be searching for library artifacts, photographing them, and submitting them to some location. Arts and Crafts time. Everyone like this part of school, yeah? You got to play with scissors and glue and markers and crayons. It’ll be just the same but a little more library or book related. In the spring we put out coloring sheets and crayons & markers for you guys to play with. Some were definitely enthused, more were either unaware, didn’t care, or were too busy cramming. We’d like to do this some more, and build on it. Book Club. Yep, a literal book club where we pick a book, everyone reads it, and we discuss. Webcasts, webinars, and Tweetchats. A wide range of topics from pop culture to how to use the computers. We’re going to try to be all over the internet trying to be of use to the Avila population. Did you miss me? I wasn’t really gone, just crazy busy with the BIG MOVE here at the library. As some of you on Avila’s campus may have noticed, the library is no longer in its usual home. We’ve moved in order for our typical building to be renovated. As of this moment I’m chilling in my “lovely” shared office space in the Resident Life office on the first floor of Avila Hall. That’s right! The library has moved a large portion of it’s bulk down to the lobby area on the first floor of Avila Hall. Looking for computers? We’ve got ‘em. Printing? That too. Circulating books? Well…we may have boxed about 85% of the books that were housed in the library and locked them up for the summer. But, don’t despair! We’ve still got the books your professors placed on reserve, the St. Paul’s collection, a hefty supply of reference books, and easy access to Mobius (so we can, you know, get all the books). Basically, the entire library (minus the books and much of the furniture…) has moved via dolly or gator pulled trailer into a variety of spaces on Avila Hall’s first floor. We even have the Archives over here! If you find yourself lost and alone when trying to locate us, just pop on to the library’s website. We have provided you with a map, complete with “yellow brick road” to follow from the old building to the temporary digs. I will ask, however, that you respect the policies of Avila Hall and enter through the first floor doors. I know it’s tempting to be lazy and stand in the vestibule on the third floor and quietly wish for someone to let you in, but please…get a little more fresh air and walk around to the front. Those doors are wide open and require no amount of wishing, crossed fingers, or possible bribery to get in; all you need is a little arm strength. If you’re still having problems finding us, try contacting us through one of our social media outlets…this blog, for example, or perhaps Facebook, Twitter, or Instagram. We’re all over the internet…just waiting for something interesting to happen. Go ahead, punk, make my day (more interesting). In less “directional” news, we’ve taken a TON of pictures and even a few videos of the move and events tied to it. I’m working on sorting through everything to bring you the least boring of the bunch. At this point we’ve got three albums up on Facebook. The first is a variety of pics taken prior to the “BIG MOVE”, “BIG MOVE day 1”, and the third is “BIG MOVE days 2 & 3”. I’ll be posting a new set of photos each day, probably in progressively smaller batches and perhaps adding more to the albums as other library staff sends me what they’ve taken. It has been really interesting seeing all the bits and pieces slowly disappear. Today, when I walked in, it was almost unrecognizable. The floor is torn up and the ceiling is completely gone in sections. All you can see are the exposed beams, some leftover duct work, and a lot of concrete and dust. I’ll be up at the library at least once a day to take new photos until they wont let me in (and then I may slip in anyway…). It is incredibly interesting to see how quickly a space can transition. Have you stopped by the library lately? Yes? It’s already starting to look a little different isn’t it? For those of you who haven’t stopped by in the last couple weeks, we’ve begun the move and it’s in full swing again this week! By the end of the day today, the Archives will be almost completely moved over to Avila Hall. It already looks pretty bare in there! Throughout the week, this week, you’ll also notice the offices and desk areas clearing out or random pieces of furniture just chilling in the middle of the room. As the (rather cheesy) signs around campus will say “pardon our progress”. It’s going to be a little messy and a little noisy in here and Avila Hall this week as we make our final preparations for the “big move” next week. Organize all loose & current periodicals for move. Pack up laptops, cases, DVD cameras, tripods, play scripts, etc. OH!! Stay tuned for some pictures and video of the move so far! The move is still on as planned! However, we are slowly compiling a more comprehensive plan of action and we’ve developed a FAQ page for students (which will be helpful to faculty and staff as well) here at Avila. If you would like to learn more about our upcoming move, please check this out! Instead of a lengthy description of what we’re planning at the beginning of April, how about I let you know a little about what we’re planning for our “new” space? Were you even aware that the move in to Avila Hall had a purpose? The move, in fact, serves as our jumping off point to begin a massive renovation of the current library space as well as a new (re-purposed) space in a nearby building. So, without further delay, here is a little list of some of the pretty awesome stuff you’ll see in our renovated space come August! More light! We’re increasing the number of windows to allow in more natural light. We also hope to improve the lighting in the building so it meshes nicely with the natural light. Exponentially more outlets. We know that the lack of power outlets has been a problem for a while, and we’re going to address it this summer! You can plug in your laptops freely! A shift from the cramped and dreary to the spacious and friendly. We’re opening up the space to become a common area for collaborative and social learning experiences. A classroom. Finally. Oh, and it will have walls you can write on. So, that is pretty awesome too. A presentation room. This room will be equipped for giving and videoing presentations. 6, count ’em, 6 group study spaces. These will also have the write on walls. Fewer computer terminals! I realize this sounds awful, since many of you are clamoring for more, but hear me out. We are embracing the shift to mobile technologies and bringing in a new fleet of laptops. We will continue to have wired desktops, just a smaller section. And yes, before you ask, we’re already looking in to wireless printing options. Printing from your iPad could very well be an option in the Fall. More comfortable seating! We’re bringing in some new comfy furniture for all you students (and some faculty) to camp out on between classes, while doing home work, or studying for finals. And last but not least…if all goes as planned, we’ll finally have a vending machine! Whether it will be in the library or in the lobby is yet to be determined, but still, no more walks to O’Riley! That is all the news I have for you all today. Stay tuned for updates! I believe we’ll be posting some pics of our earl progress in moving the Archives soon! As always, if you have any questions or concerns feel free to ask me here, on Facebook, or on Twitter! 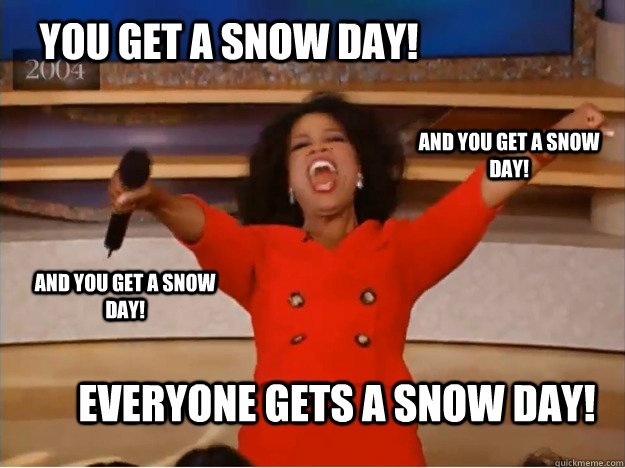 Just a quick update for my Avila University readers: Avila’s campus will be closed tomorrow! Everyone stay safe and enjoy your free day! If you must go out, be safe and prepared! I will do my best to keep you posted on any updates or changes to schedules for Wednesday!